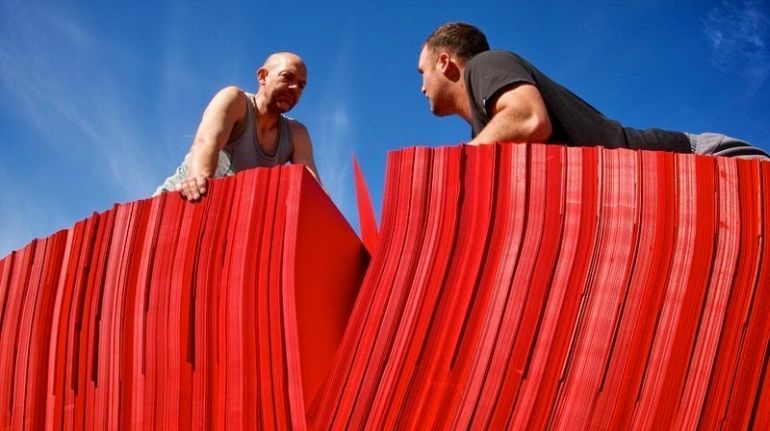 What can one make with 20,000 sheets of paper? 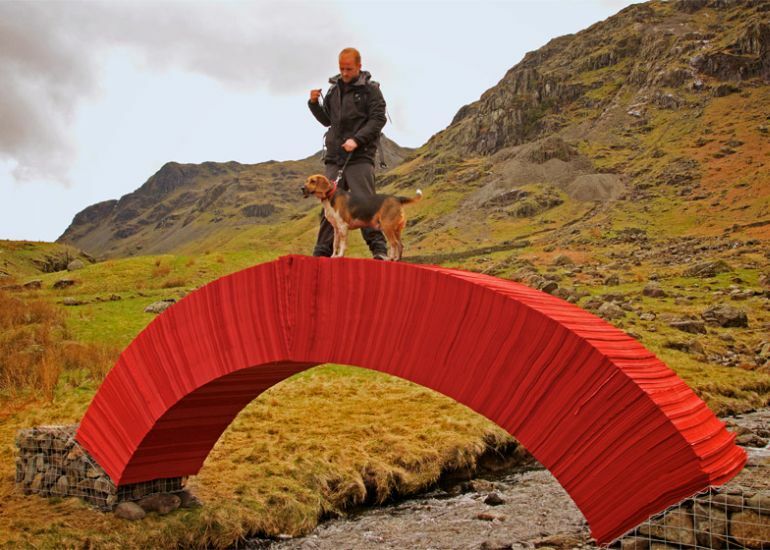 Well, a sturdy footbridge, capable of holding the weight of up to 60 sheep, apparently. 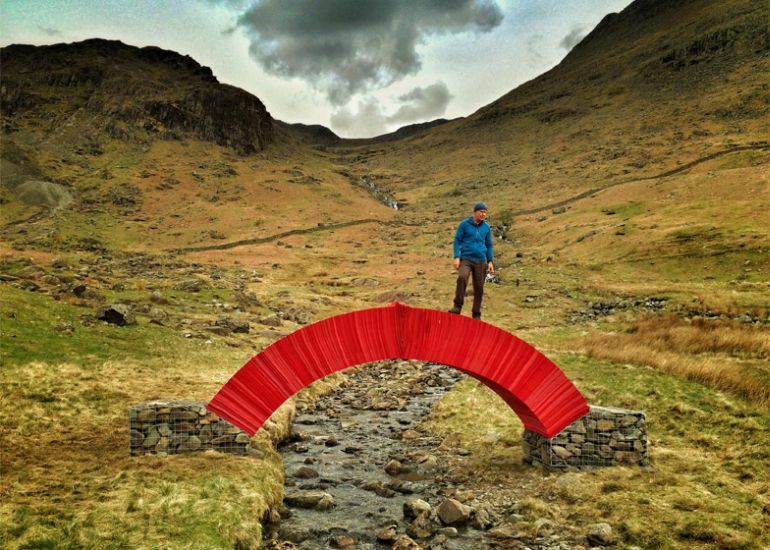 UK-based artist and designer, Steve Messam, has constructed a wonderfully innovative weight-bearing arch with nothing but several reams of brightly-colored paper. 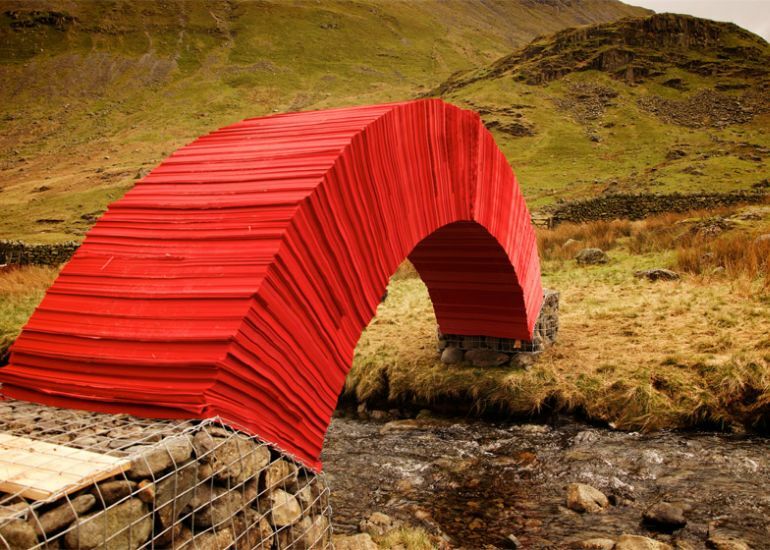 Aptly called the PaperBridge, the self-supporting structure was built over a small stream, running through the Lake District National Park in the northwestern part of England. 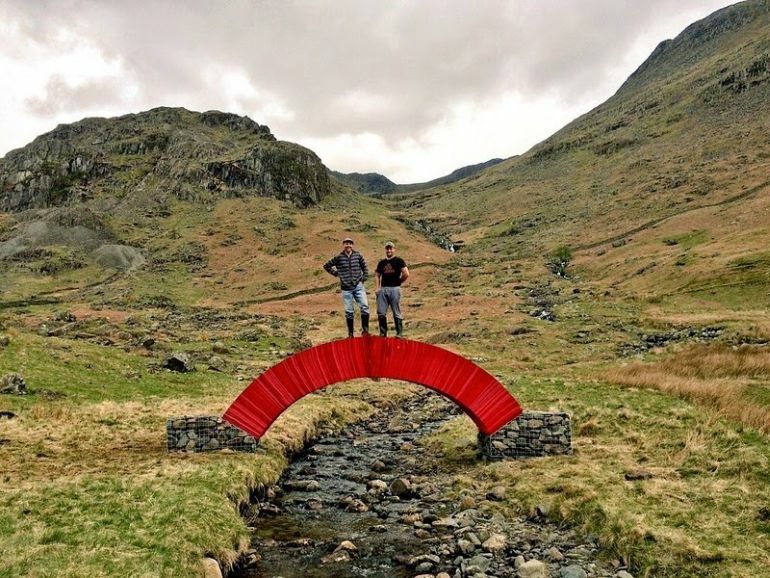 The bridge draws on the long and important history of the way the Lake District landscape has influenced artists, writers and thinkers and shaped the way we look at and understand landscape in the west. 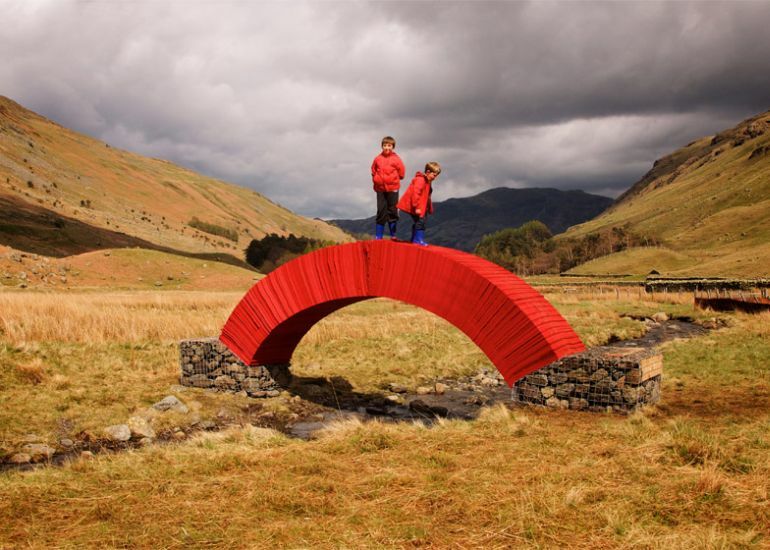 As an installation it creates a focal point within the landscape and a reference point to understand the color, shape and scale of the surrounding environment. 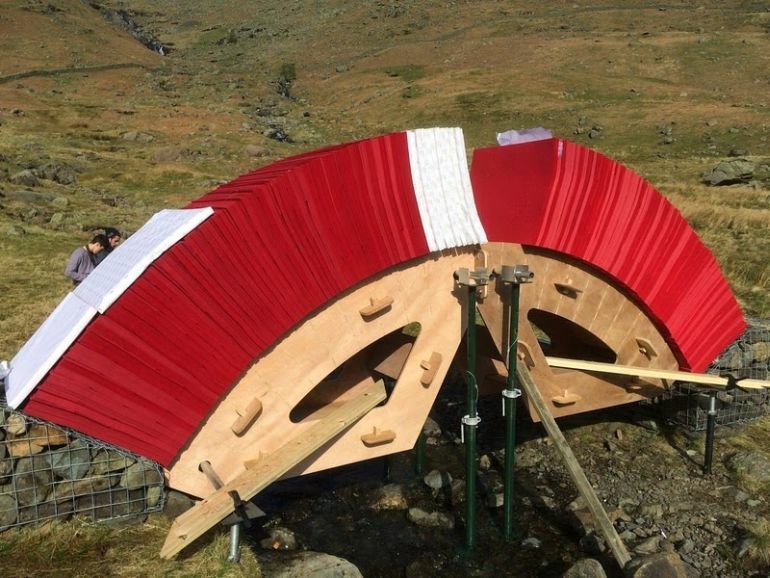 The weight (downward force) is transferred into lateral thrust by the arch construction, therefore most of the weight bearing is on the stone gabions, not on the paper. 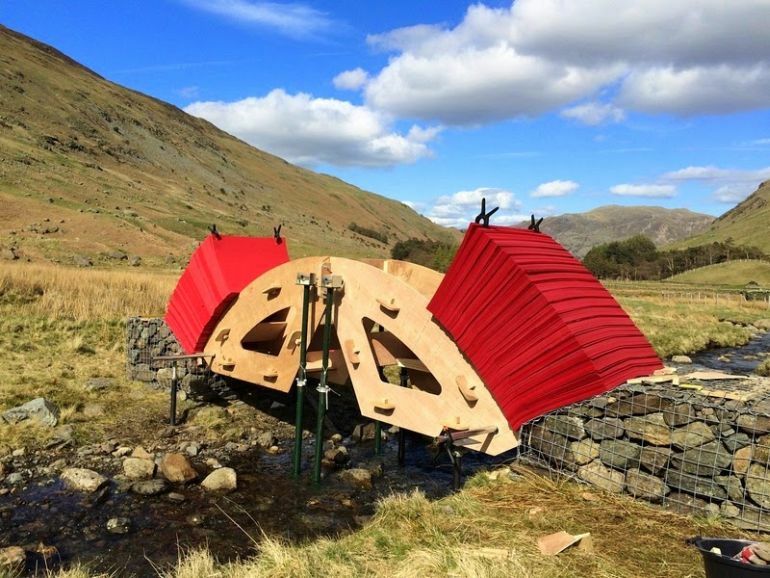 It relies on vernacular architectural principles as used in the drystone walls and the original pack-horse bridges, which have stood, in many cases, for more than a century. 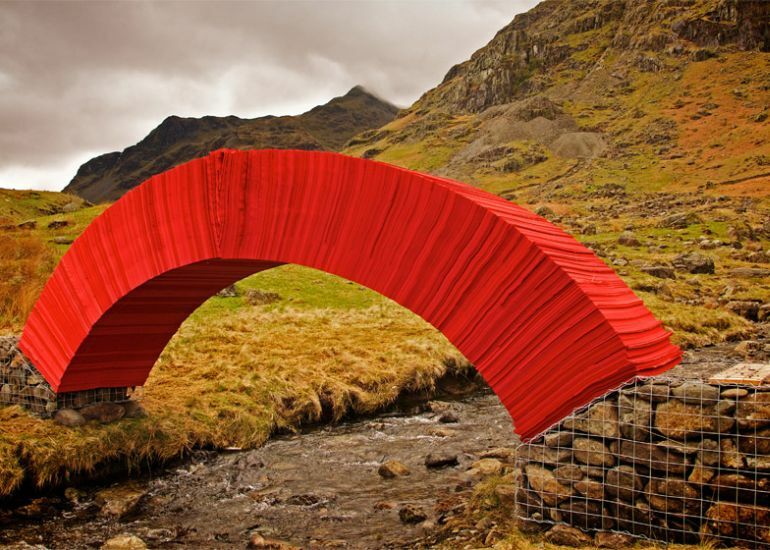 When it rains, the bridge gets wet. 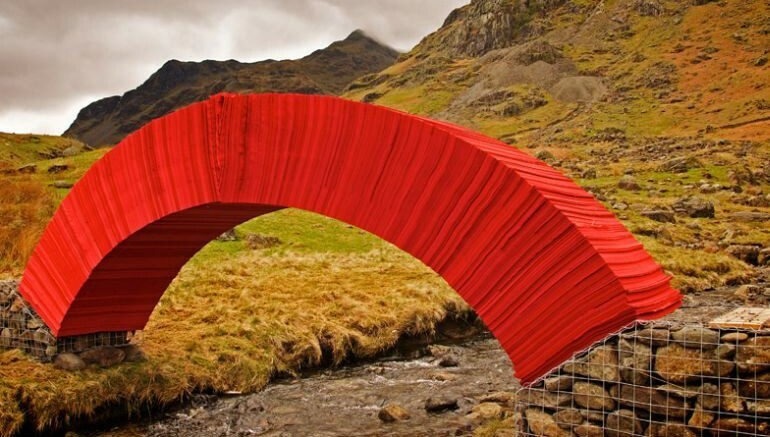 but the compression is so tight across the bridge that very little water ingresses into the paper. Any water that does forces the fibres to swell. 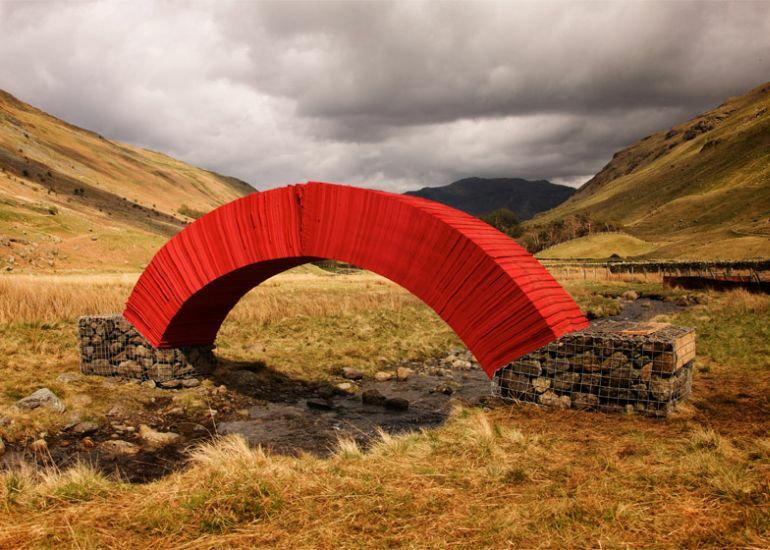 This causes the compression to increase and makes the bridge stronger… Red contrasts with the green of the surrounding hills. It makes them look greener. Then there’s the way your eyes and brain process red and how it stands out even when it’s far away. 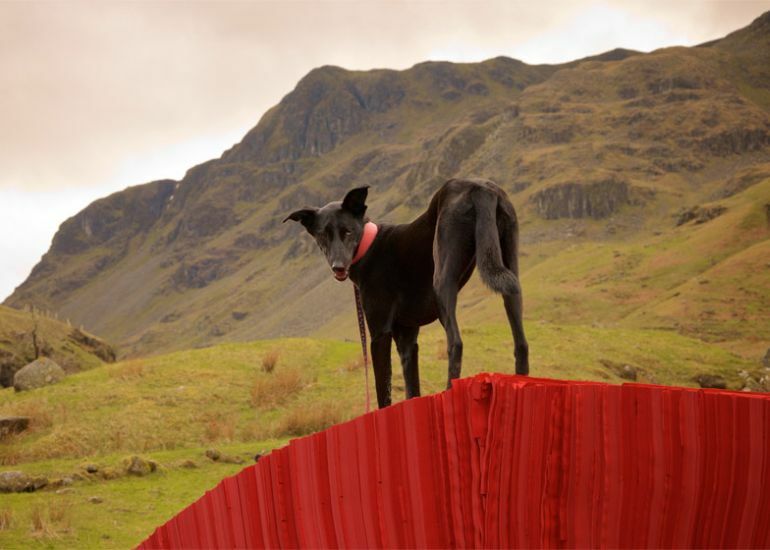 I use a lot of red in my work, but only where it’s the right color. 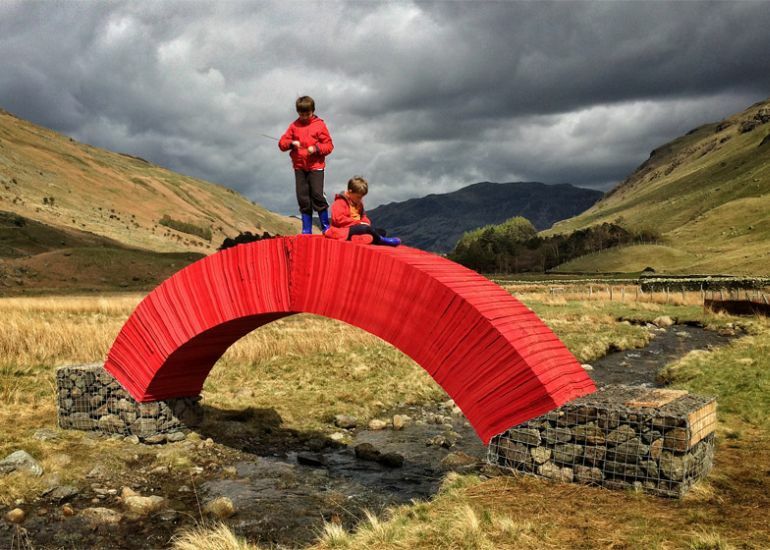 The PaperBridge is part of a ten-day project, at the end of which the structure will be disassembled and, the reams of paper will be sent for recycling. 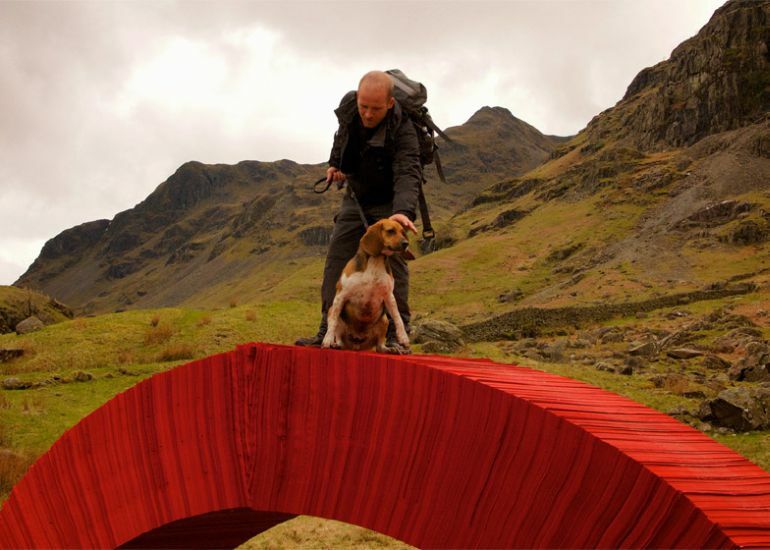 To know more about the project, visit Steve Messam’s official website.